Railing: Oak. Paintings: Acrylic and gold leaf on linen. 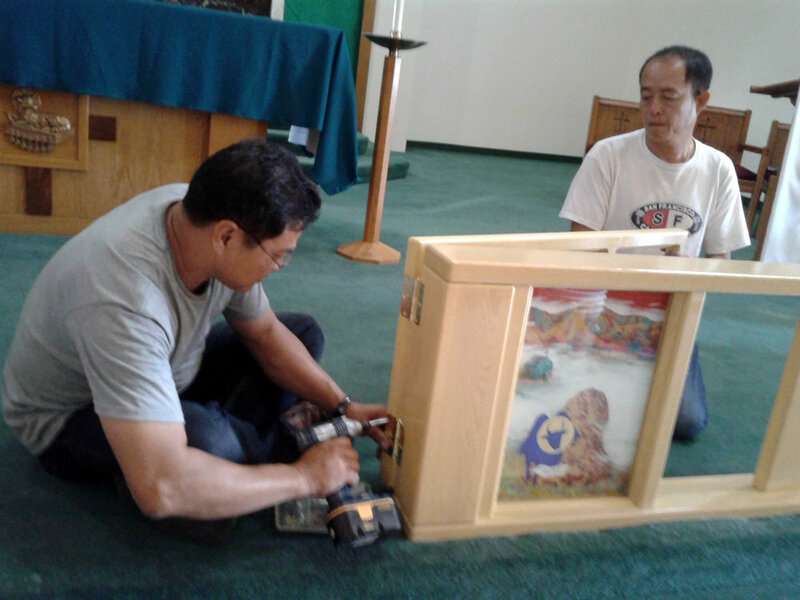 In order to frame the sacred space, an altar rail has been installed in this church. It is adorned with depictions of the four Gospel writers: Luke, Matthew, Mark and John. Inspired by the vibrant stained glass windows, which feature San Franciscan architectural landmarks and bridges, these painted panels have the Gospel writers inhabiting the natural landscape of the Bay Area. We enter from the Pacific Ocean to Land’s End, then travel to Visitacion Valley, and finally to San Bruno Mountain where we exit to the Bay at Brisbane (a nod to Our Lady of Guadalupe Mission). The Holy Spirit electrifies and invigorates the environment, and so the Technicolor techniques of the Post-Impressionists and Fauvist painters have been employed (also in line with the lively, colorful forms in the windows). The skies in traditional iconography are usually gold, but are occasionally red when referencing the Resurrection (the cornerstone of our faith) and Pentecost (the birth of the Church). In icons, red occasionally is a substitute for the sun; gold. Water, long the symbol of Spirituality and of baptism, is a bright blue, alluding to Mary. The sole man-made structure depicted in the paintings is the original Visitacion church building, and on that same panel is that “altar rock”* in the foreground. And we must not forget about the fog! White like the vestments on high holy days. It covers portions of the setting – a screen between this world and the Greater Unknown? The Great Veil had lifted..